Every now and then we are sent a gadget to review that makes us giggle and dance about like alien school children hyped up on Red Bull and Pan Galactic Gargle Blasters. The Laserpod is somewhat oddly described as a meditative ambient laser lamp that will help you “trip the light fantastic.” We were skeptical at first, but once we arrived on Planet Light (fantastic!) 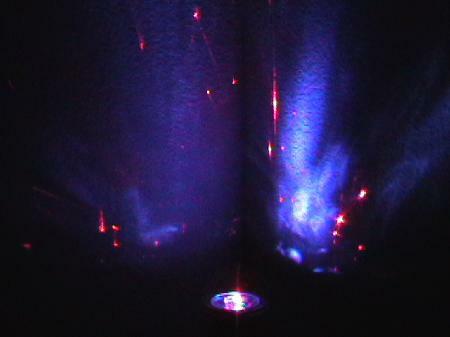 we realized just how cool the Laserpod was at creating trippy space nebula in the comfort of our own home. It’s also absolutely hilarious to see the effects it has on cats – keep reading…. 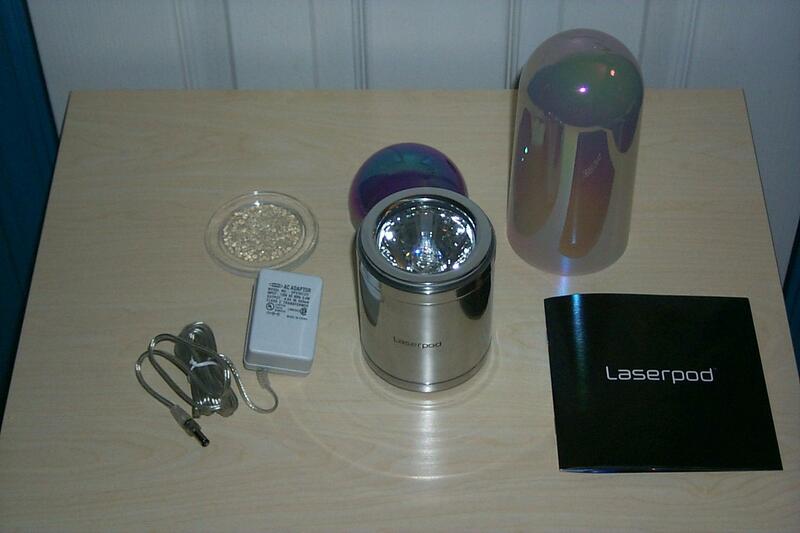 The Aluminum Laserpod projection unit (measures 10 x 8.5cm), electroplated short and tall domed diffusers, a ridged glass refractor lens, an AC adapter (also runs for a REALLY long time on 3 X AA batteries, batteries not included) and the Laserpod “Book of Light” and instructions booklet. 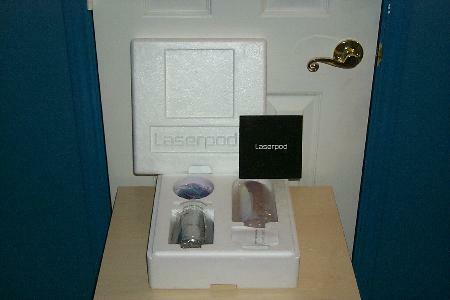 The Laserpod was designed in Great Britain by light artist Chris Levine and world-renowned photographer Mario Testino. The pure laser light it emits is refracted through a Swarovski crystal to produce a hypnotic and random light show with blue LED’s and lasers. The bottom of the Laserpod unscrews easily so that three AA batteries can be used as the power source if you do not want to run on AC power. My Laserpod runs for abour an hour each night, and I have not changed the batteries since I put them in about 4 weeks ago. It’s really handy to be able to move it from room to room without having to drag the power cord around. 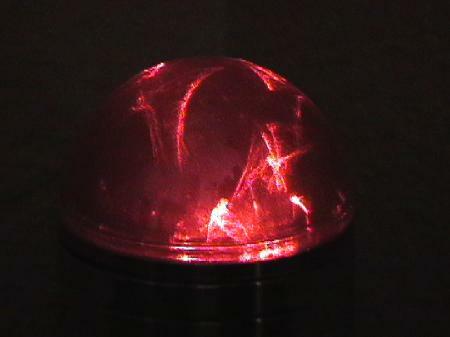 The power switch is rubber sealed and is a push button switch, and it makes a nice tactile “CLICK” when you press it. Pressing the button once will turn on the blue LED’s and the laser, pressing the button again will turn off the blue LED’s to give you only pure ruby red laser light, and pressing yet again will turn the unit off. There’s just no describing the ultra-mega neo-seventies coolness the Laserpod emits, so here’s our very own music video to show you! Click here to watch the Laserpod Music Video! Right-click and “Save target as..” to download. I can be a picky little gadget whore, and I can generally find some little thing that was missed in the design of a gadget or something that will break over time. In the case of the Laserpod there simply are no glaring flaws – we would not change a thing. The simplicity of design, form, and function make this product a real winner in our book. At $99 some may find this light gadget out of their price range, however the quality of construction and design is top notch. Anything less would seem cheap, and the Laserpod is more than just “the lava lamp for the 21st century” – it is also an elegant work of art. We’re addicted to ours, and so is the cat in the video. If you have cats and have seen how crazy they go over a single laser dot from a laser pointer, wait till you see how they react when they see the Laserpod! CLICK: Buy your Laserpod today – The Utimate Light Trip for both Man and Cat! I have one of these, and I love it. Well execpt for the sound it makes when it is on. I am not sure why it makes noise, but it hums and the sound fills my office with a baground noise and I end up turning it off. Could just be a manufacturing flaw in mine. Other than this, the thing I would recommend it for others. That’s odd, because the one we reviewed runs totally silent. You might want to contact the company you purchased yours from and see about getting it fixed, or a new one. When you say “This means no staring directly into the unit or the beams it emits”, does this mean you shouldn’t look at the product but just the beams on the wall? I’m under the impression that you can stare at it all day long as long as the difuser is in place correct? Correct – if either dome diffuser or the glass diffuser are in place the product is safe to look at all day long, however if you are not using a diffuser you should not look directly into the lasers emitted. I purchased mine directly from the LaserPod folks. If your’s is silent, I’ll shoot them some email and see what they say. I love the way it looks, just can’t take the sound it makes. Sure thing, I hope they are able to help you. If they don’t please let us know about it. I guess I’m in the minority here, but I’m finding this gadget rather underwhelming. I don’t find the display the Laserpod produces to be anywhere near as interesting as, say, the light show produced by the Mathmos Space Projector… a misting fountain with color-changing LEDs… or even my trusty old Lava Lamp. Of course, I don’t have any cats, so maybe I’m missing something there. 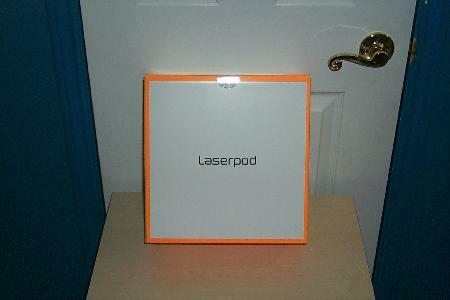 To me the Laserpod rates a “ho hum” and doesn’t live up to the hype. Next? It’s hard to see how very cool it really looks in our video. We tried hard to capture the effects it makes, but they look much better in person. I really want one of these… BUT! I think it needs a line level input for some sort of beat detection. Hook it up to my iPod and prepare to vegetate. The way the motor spins and the way the lasers refract off the Swarovski crystal I am not sure an audio input jack would make any difference. The laser beams are random, so it actually works fine without an audio input. I agree with Mr Slezak. I love the light effect but the working noise after some minutes always makes me turn it off.